To push us toward our fundraising goals, our generous sponsors Josie Greene and Glenn Asch have given us a challenge grant! Every dollar you give up to a total of $5,000 will be matched by Josie and Glenn! We have 5 days to raise 5k - that means before April 18! The Peace Institute is filled with hope after a weekend of action across the county with the goal of creating and sustaining communities that are free from gun violence. The Peace Institute has been working toward that vision since the murder of Louis David Brown in 1993. Louis was a young champion of peace who, like so many young people in the streets this weekend, was tired of seeing his friends end up dead. He believed and we believe teenagers have the power to make monumental change as we’ve seen again and again throughout history. Young people: we’re grateful for your courage. We’re moved by the principle of unity as we see youth from different races and class backgrounds come together to address the violence that happens in our respective communities. We’re amplifying the leadership of survivors of color, because Black and Brown people are most impacted by both homicide and by the criminalization of gun ownership. Without recognizing that racism is a root cause of violence in this country, we cannot heal from these wounds. Over the past two decades, the Peace Institute has worked alongside likeminded advocates of all ages through many waves of advocacy for more and better gun control. We’ve provided emotional and practical support to hundreds of survivors in the aftermath of their loved one’s murder. Many of these murders were not covered on the news, like a homicide that happened in our city less than twelve hours after Boston’s #MarchforOurLives. All families of homicide victims deserve to be treated with dignity and compassion, whether their loved one was murdered in a school or on a street corner. We will strengthen our movement by rejecting the idea that only some victims are worthy of our grief, leaving others to be overlooked or forgotten. We mourn all murder victims – from Parkland to Dorchester – and acknowledge the pain and anger families are feeling. After a homicide families experience physical, emotional, and financial stress that can destabilize entire communities. We’re committed to serving these families, and working with partners and allies around the country to ensure they have equitable and effective responses in place no matter where or when violence occurs. These interventions have and will interrupt cycles of violence. Now is the time to push the conversation past the reflexive calls for more police, swifter prosecutions, and longer prison sentences. In this movement moment, let’s focus on primary prevention. Our young people need social-emotional learning in schools, culturally responsive mental and physical health care, and opportunities to heal from the trauma of bearing witness to and surviving violence. Adults must also have spaces and strategies for healing, teaching, and learning that allow us to address our unresolved grief that compounds generational trauma. The solutions to the crisis of gun deaths are not simple, nor limited to legislative change. We need a cultural transformation. True peace is only possible when all families are valued and have what they need to live well. Concrete commitments can help us move past feeling scared and overwhelmed. One way to take action locally and support the survivor community is to join us at our 22nd Annual Mother’s Day Walk for Peace on May 13. Our doors are open to you and your family. Join us at the Walk Briefing at the Hampshire House on 3/28! CHALLENGE GRANT TIME! We need YOU! 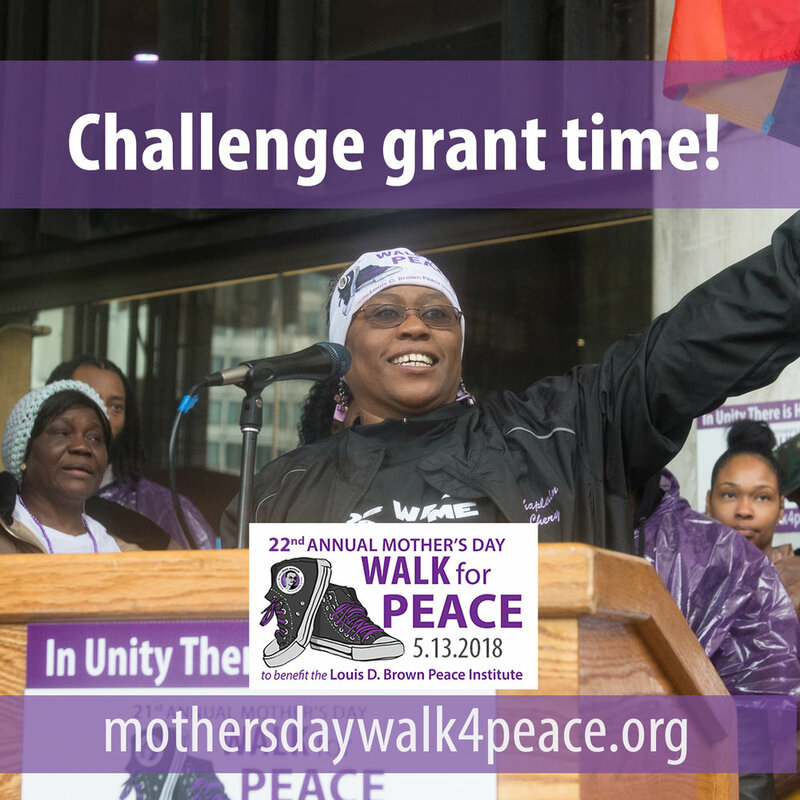 The Mother's Day Walk for Peace is our most important fundraiser of the year. In 2018, our goal is to raise $400,000 so we can expand the services, training, and advocacy work we do. To lead our fundraising efforts, donors Rick and Gitte Shea have challenged us with a matching grant! This supporter will match donations up to $5,000 for all gifts made by March 15! 1. Start a team and encourage your network to give to your team page! 2. Give to a walk team of a friend, family member, coworker, or survivor in our community! On Sunday, March 4, Latoyia Edwards hosted Tina Chery and Danielle Bennett on This is New England on NECN to speak about the work of the Peace Institute. Curious about the Walk? Do not know where to start? ATTEND A DROP-IN WALK INFO SESSION. A chance to register, start a team, and pick up print and promo materials. We are excited to announce our 2018 Walk Co-Chairs.